So far, the “Xbooster” malware has infected enough machines using Windows operating systems to harvest approximately $100,000 worth of monero, according to Krishna Narayanaswamy, founder and chief scientist of Netskope. 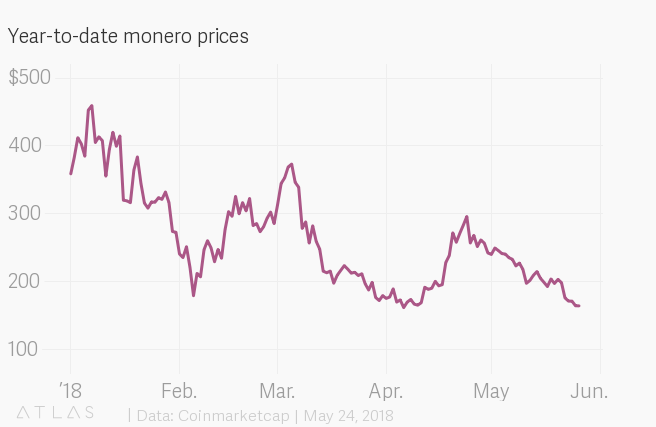 Hackers are pirating computers to mine monero, which is more difficult to track than bitcoin, because it’s in the “sweet spot” of the amount of processing power required and the monetary benefit from doing so. The Xbooster malware is hosted in the cloud on Amazon Web Services (AWS), according to Netskope. From there, a command-and-control server installs two programs on infected machines: A monero miner and a manager that connects to the server. People accidentally install this malware on their computers by clicking a link in a “drive-by download.” This usually happens through an e-mail campaign, a compromised website that shows up in search results, or the malware may be bundled with other types of programs like freeware or shareware, Narayanaswamy said. To mine crypto assets, computers compete to solve complex mathematical calculations and confirm transactions within the network to generate digital tokens. But doing so requires substantial processing power, or CPU usage, which is why hackers have to pirate a large number of machines to be effective. Bitcoin has become far too difficult for hackers to mine—these days it requires massive warehouses stocked with specialized computers to be successful—but less widely used cryptos like monero still provide an opportunity for smaller, distributed operations. Netskope says it doesn’t know who the hackers are or where they’re located. While the amount of money the malware has generated for its owners is relatively small, the threat is ongoing and difficult to detect. To avoid detection, the command-and-control module residing on AWS keeps the infected computer’s CPU usage low enough that its owner is unlikely to notice. Narayanaswamy says “endpoint security” can help with this type of security for everyday consumers.